Judges;-Mr George Neve, Haining House, Lambley, Brampton & Mr Norman Ireland, Newhouse Farm, Drigg, Holmrook. One of the best shows and sales in recent years meant there was a real buzz about Galloways at Carlisle. Harrison & Hetherington’s main auction mart. With 100% clearance on females and a massive £734 increase in average for heifers with calf or in milk resulted in vendors going home with a smile on their faces and prospective purchasers going home empty handed. The female champion was the much fancied and very stylish senior heifer West Acres Fern from Mr Graham Noble, West Acres, Kirklinton, Carlisle, she is by the old AI Bull Grange Mozart and out of Barlaes Nancy, which Graham kept after his dispersal and sadly lost only last month. This September 2011 born heifer made 2400gns and went home with the judge Mr Norman Ireland. 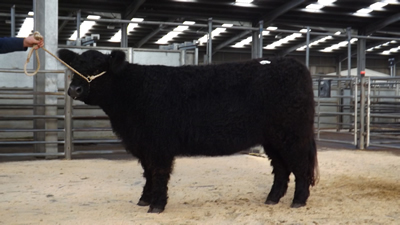 Mr Ireland purchased 13 pedigree females including the reserve champion from Kilnstown Farms Ltd, Kilnstown, Bewcastle, Carlisle, Bridget 24th of Kilsntown is by Orinocho of Over Barskeoch and out of Bridget 8th of Kilnstown, this March 2012 born heifer sold for 1500gns. She was from a consignment of 6 pedigree junior heifers from Kilntown, which averaged 1591gns. The male champion, Popeye of Over Barskeoch was from J & M Thomson, Nether Linkin, Gelston, Castle Douglas, this 2007 born Greenloop Limited Edition son sold for 1200gns to CA Hall, Whitchester Farm, Haltwhistle, this impressive bull was only being sold as his daughters were being retained in the herd. Also making 1200gns was the reserve male champion Medely of High Creoch from G & K Gilligan, High Creoch, Gatehouse of Fleet, Kirkcudbrightshire, this Excelsior of High Creoch son and out of Charity 16th of High Creoch went home with Mr D Scott, The Minch, Bolton Low House, Wigton for a new stock bull. The best pair of heifers was from WG & HM Kyle, Spout Bank Farm, Brampton, Cumbria, Poppy and Lovage of Nether Linkin, bred by J & M Thomson, Nether Linkin, these stylish heifers were both Popeye of Over Barskeoch daughters (which had been sold earlier in the day) made 2000gns each to Mr H Paterson, High Ickethwaite, Rushland, Ulverston. A great run of 10 heifers with Bluegray calves at foot from regular consigners W & M McMorran, Miefield, Twynholm Kirkcudbrightshire made an impressive average of 1788gns. Top price for the McMorran family was Tracy 20th of Miefield, this Loyal of Kilnstown daughter made 1950gns to A & A Hogg, Milnholm, Langholm, next at 1880gns was Lady Nancy 85th of Miefield another Loyal of Kilnstown daughter sold to RE Wood & Son, Kingledores, Biggar, Lanarkshire.